In brightest day, in darkest night, Green Lantern manages to shine bright! Now let me just say upfront, I’m a huge Green Lantern fan! And over the course of the last year and a half, I’ve been looking forward to, as well as fearing, Warner Bros. big screen adaptation of my beloved Green Lantern. I tried to keep myself from seeing too much footage leading up to the film’s release, however the trailers I did see, looked good for the most part. Although, I would be lying if I didn’t say that there were a few things that did cause me to worry that the film might not live up to my expectations. 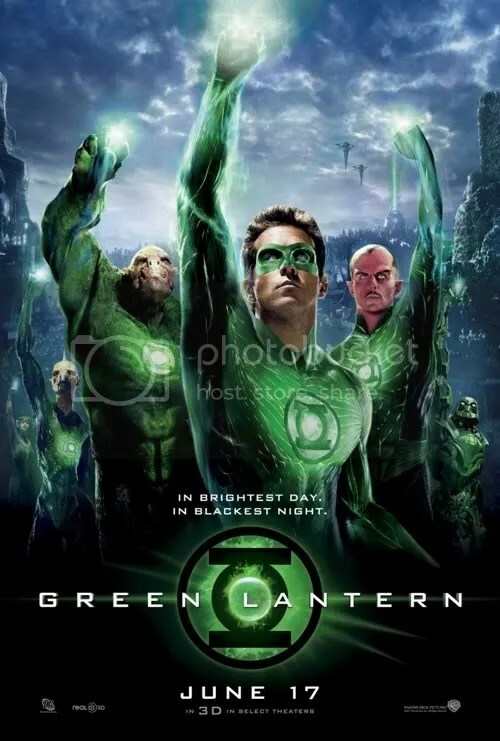 The trailers and marketing campaigns, at times, did make it look like the film might focus a little too much on the Green Lantern’s Corps and all its members, and not enough on Hal Jordan. It also looked like there were going to be a lot of epic space battles, and a part of me was worried that the CGI would take over the show, causing it to become another movie that was more animated than actually filmed, much like Avatar. These were all fears mind you, which is ironic, given the nature of the Green Lantern story. 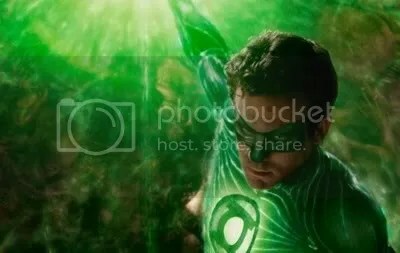 In Green Lantern, test pilot Hal Jordan (Ryan Reynolds) is doing the best he can to hold on to his wild and carefree life, but the galaxy has other plans for him. Unbeknownst to Hal, or any other earthling for that matter, there is a galactic police force in place known as the Green Lantern’s Corps. On the planet Oa, a group of beings known as Guardians of the Universe, forged a series of rings each with the ability to harness the raw green energy of will power. The rings are the source of each Green Lantern’s power, and they are only limited by its wearer’s will and imagination. The rings themselves have the ability to choose only the most worthy to wield their power, and when a Lantern dies it is up to the ring to find its nearest successor. The only job description is a being without fear. Fear is a Lantern’s biggest challenge, and it’s the yellow energy of fear that is currently threatening the universe. 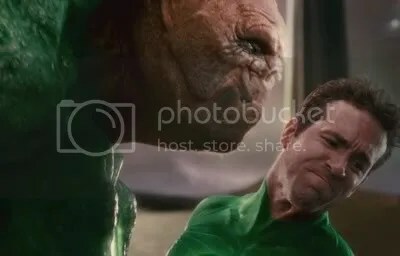 When Abin Sur (Temuera Morrison) is fatally wounded, he races to the nearest planet in his sector, which just so happens to be Earth, so that the ring will be able to find a successor. That’s right; it’s none other than Hal Jordan! The man without fear… Well, if you don’t count commitment and responsibility. I’ve got to say, I really enjoyed this a lot more than I thought I would! They somehow managed to pull it off! It’s got a little bit of an old school feel to it, in the spirit of Superman and Star Wars. I’m also glad to report that my fears were ill founded. The filmmakers take us to Oa, but at the same time manage to keep the story mostly grounded on Earth. It’s a really happy balance. We get to see tons of Lanterns, and at the same time never feel bombarded. 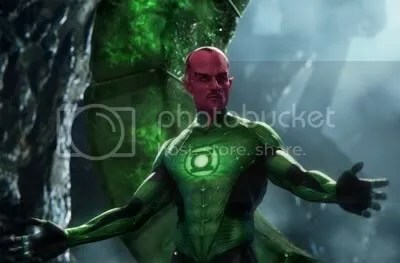 Even though I’m happy with the balance, I would like to have spent a little more time with Sinestro (Mark Strong), Kilowog (Michael Clarke Duncan), and Tomar-Re (Geoffrey Rush). Speaking of which, the casting in this movie was amazing! This might come as a bit of a shock to some of you, based on one of my earlier statements (which can be found here). 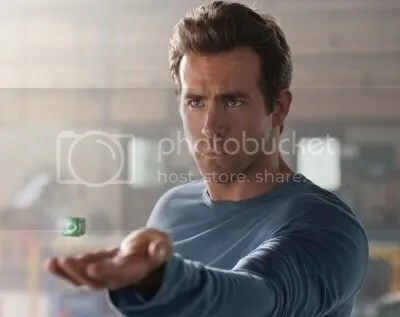 Ryan Reynolds makes a pretty good Hal Jordan! He didn’t play him the way I originally thought he would. I’ve got to say, I was wrong. That doesn’t mean that I don’t think Nathan Fillion is still the best choice, it just means that Ryan did a really good job. But hands down, the show stealing performance of this movie has got to go to Mark Strong! He manages to embody everything I’ve ever imagined Sinestro to be. I really would have liked him to have gotten a little bit more screen time. The movie does have its flaws, however minor. The 3D looks nice at times, but overall is not needed, and ultimately underplayed. There’s a helicopter crash at one point in the movie, and not only does it look like something out of a bad amusement park ride, but you can tell they were hoping to get a nice little 3D moment out of it as well. Sadly, it doesn’t work. The angle’s not right, and the whole sequence seems rushed. (For those of you that have already seen it, I’m talking about before Green Lantern shows up.) There’s one other thing that bothers me, and it makes no sense. The reason I like DC Comics more than Marvel, is because I believe the characters of the DC Universe can cross paths and interact with one another in a more believable way. I buy Superman working with Batman, or the Green Arrow teaming-up with the Green Lantern and Flash, where as with Marvel, I don’t buy any of their characters interacting with one another. But, in each of their movies they successfully bring up other characters. For about a half a second I thought it might happen in Green Lantern, and that we might finally get that acknowledgement of other heroes in the DC Universe, but no such luck. If Warner Bros. could take one page out of a Marvel’s movie making playbook, it would be that one; especially with the announcement of a Justice League in the near future. The only other thing I wasn’t a big fan of, was the add-on scene at the end of the end credit sequence. It felt really out of place. I realize they want to entice the audience with the hopes of a sequel, but that scene felt like something that they shot in an alternate script draft and wanted to just tack it on for the sake of tacking it on. Also, that five second clip should be the entire storyline of the second movie! Which I guess they could still do, but talk about your spoilers for people that don’t know that’s coming! Oh, well. I’m glad the movie didn’t let me down and I’m looking forward to seeing it again real soon! Great review. I have a solution in my review that would make that “end credit” sequence make make more sense. 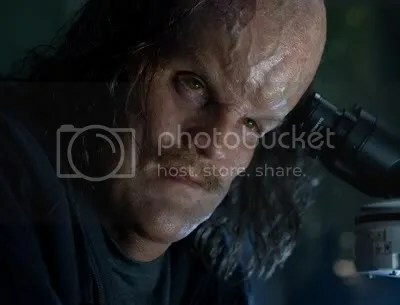 I cant wait to see the sequel where Sinestro secretly hides his newfound abilities behind the Guardians’ backs. « The Stash is Two Today!